Description: Lake Shore Limited #449 arriving at Framingham. Description: The SW-Chief made an unscheduled layover, when the Chief had a minor derailment in Argentine, KS (just west of Union Station). Description: Amtrak P92 is passing by the North End Double Track signal in Winter Park. Description: This is 3 miles SE of Fredericksburg at Massaponax Virginia also known as Hamiltons Crossing. Description: The westbound California Zephyr heads through some heavy snow flurries as it travels through Downer's Grove. Description: NS 04T pauses in downtown Altoona. Description: 04T waits to leave at Altoona. Description: Westbound Pennsylvanian making its next stop at Altoona. Description: coming in to station in black and white.. 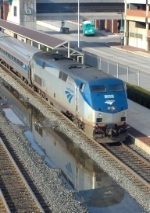 Description: Amtrak 49 passing MOW equipment in the interlocking at Berea. 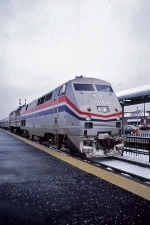 Description: Amtrak 94 leads Train #51, The Cardinal, through VRE's L'Enfant Plaza station. Description: DE 683 passes through Andover heading to Portland.